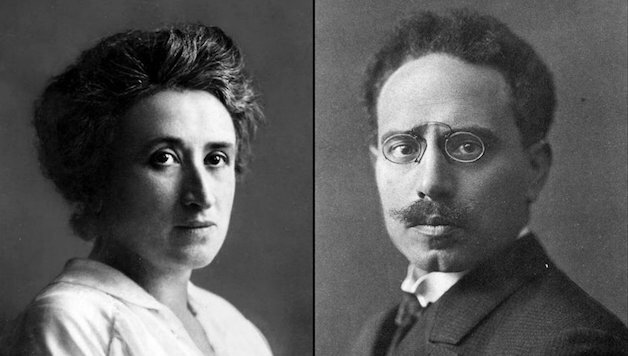 Today marks the 100th anniversary of the murders of Rosa Luxemburg and Karl Liebknecht, two of the outstanding leaders of the German and international working class movements. They are figures who still today symbolise uncompromising opposition to capitalism and imperialist war and who fought and died for a socialist future. They left an important legacy and stand as symbols for socialism. She ends her comments by saying “What is in order is to distinguish the essential from the non-essential, the kernel from the accidental excrescencies in the politics of the Bolsheviks. In the present period, when we face decisive final struggles in all the world, the most important problem of socialism was and is the burning question of our time. Luxemburg and Liebknecht died at a critical stage in the history of the international workers’ movement and it is quite justifiable to say that their early deaths helped open the way the horrors of the last 100 years as lost opportunities and defeats for the workers’ movement allowed capitalism to remain, Stalinism to develop in the 1920s and the later victory of Hitler’s fascism. At the end of 1918 and start of 1919 Germany was at a central point of the international wave of revolutions that both helped finally end the First World War and also put on the table the question of whether capitalism itself would survive in Europe. In many countries deep distrust, hostility and often open hatred of the ruling classes, combined with the international impact of the 1917 October revolution in Russia, fuelled a popular surge to the left, enormous growth in workers’ organisations and an urge to follow the Russian workers’ example. Empires, dictatorships, authoritarian regimes tumbled, workers gained confidence and the capitalists and ruling classes’ fear of revolution increased. They were determined to fight to prevent the spread of socialist revolutions and also try to overthrow the Bolsheviks’ revolutionary government in Russia. And this did not only mean a political fight, but armed struggles as revolutionary Russia was invaded by 21 imperialist armies and, in country after country, military forces and armed counter-revolutionary militia sought the opportunity to crush revolutions. For a time Germany was the key to what would happen. Despite its military defeat Germany still had the biggest population in Europe. While at the end the war it was Europe’s second largest economy, Germany retained enormous economic potential having been the biggest European economy pre-1914. But also significantly Germany had historically the strongest workers’ movement in Europe with traditions of struggle which were being reborn in growing socialist anti-war protests and exploded into mass struggle in the November 1918 revolution. In a matter of days the German Empire, the Kaiser and the government were overthrown. Workers, soldiers and sailors were, following the example of the soviets (councils) created in the Russian revolution, forming councils across the country which challenged the existing state power, often effectively governing areas. This not only shocked and scared the German ruling class and military leaders, but also the Social Democratic Party (SPD) and trade union leaders who, in 1914, abandoned socialist principles to support German imperialism in the war. This support of the SPD leaders for German capitalism naturally extended to bitter opposition to revolution. Thus as the November revolution unfolded Ebert, the SPD chair, warned that “if the Kaiser doesn’t abdicate the social revolution is unavoidable. But I don’t want it; indeed I hate it like sin”. Using the historic prestige of the SPD, then still seen by many German workers as ‘their’ party, the SPD leaders strove to win time for the stabilisation of capitalism. The SPD leaders were open to overtures from the military high command. On November 10, the day after he became German Chancellor (prime minister), Ebert accepted the offer from the new army chief, General Groener, of a “common front against Bolshevism.” In other words Ebert and the central SPD leaders were preparing from day one of the new republic the possible use of the military against the revolution. At first this was threat kept in reserve, the SPD leaders used radical gestures to try to placate the working class. Thus the day after Ebert made a deal with General Groener the SPD formed a government which adopted the name ‘Rat der Volksbeauftragten’ (RdV, ‘Council of People’s Commissars’), almost an exact translation of Bolshevik government’s name in Soviet Russia. To try to control the growth of the left they brought into the government the newly formed left and anti-war Independent Social Democratic Party (USPD), a party whose membership ranged from reformists to revolutionaries. But, while the government’s name was virtually the same, there was a fundamental difference between the SPD working to save capitalism and the Bolshevik government striving to end it internationally. The SPD particularly feared the impact of Karl Liebknecht and Rosa Luxemburg. Liebknecht, the son of one of the SPD’s central founders, had a prominent position as a left and anti-militarist before 1914. This was consolidated when he became the first SPD MP to vote against the war. After Liebknecht’s jailing to four years hard labour for making an anti-war May Day speech over 55,000 Berlin workers struck in protest in June 1916 in the first political anti-First World war strike in Germany. Rapidly Liebknecht became a major symbol of opposition to the war, enjoying widespread popularity. Rosa Luxemburg had for many years been a key leader of the revolutionary left in the SPD and, after 1914, of the opposition to the war. However for a long time, unlike the Bolsheviks in their struggle between 1903 and 1912 for revolutionary policies in the Russian Social Democracy, Luxemburg had not drawn together the Marxist wing into a coherent, organised opposition that systematically fought both for its ideas and to build support. While Luxemburg and others had formed in early 1916 the loosely organised, and fiercely repressed, Spartakus group, it was only as the revolution began to unfold that steps were made to bring together and organise the revolutionary forces into a party. The end of 1918 saw the formation of the Communist Party (KPD) with Liebknecht and Luxemburg being seen as its main public leaders. Already as 1918 drew to a close the SPD leaders started to take action to curtail the revolution, especially in Berlin where the revolutionary wave was strongest. Berlin was a key battleground, then it was the fourth most populous city in the world and, internationally, the largest industrial city. Fearing further radicalisation and growing support for the left, the SPD leaders moved to reassert control. December 24 saw a SPD ordered military attack on the People’s Naval Division (Volksmarinedivision), a force that originally had been sent to Berlin to safeguard the SPD but which had become increasing radicalised. While this attack was repulsed it led to a crisis in the government and the departure of the USPD ministers. They were replaced by SPD representatives including Gustav Noske who, becoming responsible for the army and navy, quickly began organising the military forces of counter-revolution, the Freikorps militia (many of whom later in the 1920s joined the Nazis). By the end of 1918 the SPD had begun to deploy Freikorp units near Berlin in preparation for a blow against the revolution. Germany then still faced a situation of dual power. On the one hand the revolution had swept from power large parts of the old regime. For a few weeks at least many workers’, soldiers’ and sailors’ councils held real power, but this was not consolidated. From the beginning of the revolution the SPD leaders were working with the capitalists to neuter the councils and restore normal bourgeois government. But the SPD had to move very carefully because the revolutionary tide had not ebbed. Nevertheless, as happens in most revolutions, there came a time when sections of workers felt that their power was slipping away and the capitalist order was being re-imposed. In many cases, as in the ‘July Days’ in the 1917 Russian revolution, this can lead to spontaneous attempts to stop the revolution being rolled back. The SPD leaders were aware of this and moved to try to provoke the more radicalised workers into taking premature action, premature because the mass of workers had not yet drawn the same conclusions as they had. In December the SPD government decided to organise a provocation in Berlin. Having gathered counter-revolutionary Freikorp troops outside the city, they ordered the removal of Berlin’s police chief, the USPD member Emil Eichhorn on January 4. At a protest on the next day the Berlin USPD, the Revolutionary Shop Stewards and the new formed Communist Party (KPD) called a mass demonstration for January 5 to defend Eichhorn’s position and around 200,000 participated. The success of that protest convinced some of the leaders that it was possible to overthrow the government and an ‘Interim Revolutionary Committee’ was established. In this committee Liebknecht, supported by the later East German leader Wilhelm Pieck, argued in defiance of KPD policy that it was “possible and necessary” now to overthrow the SPD government. The next day, January 6, Berlin saw a bigger demonstration of around 500,000 workers, many armed, but they waited for hours in the rain before dispersing, as the Revolutionary Committee was unable to give any proposals on what they should do. This attempt to seize power was premature, falling for the SPD leaders’ provocation, who could picture it as an attack on the government, against the majority of workers and soldiers’ councils and the forthcoming national assembly elections. It is probably the case that, on the January 5 protest, agent provocateurs encouraged the occupation of the offices of the SPD and bourgeois newspapers, not the most important immediate targets for a successful revolution, but a suitable target for the Freikorp troops. Although the revolutionary workers were probably strong enough to rule Berlin alone this was not the case in much of the rest of Germany, where illusions and hopes still existed in the SPD government. As was seen in other German cities in the following few months, at that time a victorious insurrection in Berlin would have probably been isolated and open to counter-revolutionary attack. On January 8 Noske’s troops began their offensive, politically dressing it up as a fight against ‘terrorism’. In a statement Noske, claiming to be defending the SPD’s history and workers’ unity, said that he, “a worker, stands at the peak of power in the socialist republic”. The reality was brutally different. Noske was not joking when he said just before this battle “if you like, someone has to be the bloodhound. I won’t shy away from the responsibility”. Noske helped organise the Freikorps as a counter-revolutionary force one of whose tasks was to attempt to behead the revolution by killing the most well-known Communists, Luxemburg and Liebknecht, and suppressing it in the capital, then one of the most radicalised areas. Not one of them is there, not one of them is there! Liebknecht and Luxemburg were murdered in cold blood after their arrest by Freikorp officers on January 15, three days after the fighting had stopped. This was not accidental. At a memorial meeting in Petrograd a few days later Leon Trotsky, one of the central leaders of the October Revolution, drew parallels with 1917 and spoke of how the German “bourgeoisie and military have learnt from our July and October experience” and acted to try to behead the revolution. As the fighting in Berlin was coming to an end a council republic was proclaimed in Bremen and, after finishing in Berlin, Noske ordered Freikorp units to crush the movement there. But this in turn provoked mass strikes and fighting in the Ruhr, Rhineland, Saxony and, at the beginning of March, a general strike and more fighting in Berlin. In other areas like Hamburg and Thuringia there was also a near civil war situation, while in Munich the council republic there was one of the last to fall, in early May. However even when initially defeated with thousands killed in 1919, the movement’s strength was strong enough to prevent the counter-revolution crushing all democratic rights. Hand in hand with bloody repression the counter-revolution was forced to take a partially ‘democratic’ form, even sometimes dress itself in ‘socialist’ phraseology – for the time being. But the SPD paid a huge price for its role, millions of workers turned away from it in disgust. Having won a record 11,509,000 votes in the January 1919 election eighteen months later the SPD’s vote slumped to 5,617,000. At the same the left USPD saw its vote more than double from 2,317,000 to 4,897,000, alongside 442,000 votes for the KPD. A few months later, in October 1920, a majority at the USPD’s Congress in Halle voted to merge with the KPD. This gave the newly unified KPD a mass base and the opportunity for the KPD to learn from the experiences of the November revolution. Although capitalism survived this first round, the German revolution was not over as millions of workers moved to the left, stopped supporting the SPD and, by the end of 1920, made the KPD a truly mass force. However the tragedy is that when, after a series of heroic struggles, the KPD was able to get majority support amongst workers for some months in 1923, but let the opportunity slip, with the disastrous consequences that instead of the world being completely transformed there was the rise of Stalinism, and then Hitler’s later victory, with all that those events meant for humanity. Previous articleChicago Wants Rent Control – Escalate to Beat the Developers!